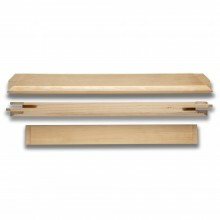 Purpose made stretcher bars ready to assemble into any size. Simply choose 2 pairs and fit together. All stretcher bars have a bevelled edge meaning that the stretched canvas will not show an imprint of the bars, and are designed for a seamless fit at the corners. The aluminium bars are a new advancement in stretcher bar technology, offering a lightweight, warp free alternative. Please note that some stretcher bars are cut to order and can take up to 2 weeks to be delivered by Standard UK delivery. If you choose next day delivery at check out your stretcher bar will be expedited and the delivery time will be shortened by a couple of days. To avoid unnecessary delays with any art supplies you wish to purchase we advise that these are ordered separately. 2 bar types, available in sizes from 20cm to 200cm. 2 bar types, available in sizes from 12 to 40 in. 2 bar types, available in sizes from 9 to 54 in. 2 bar types, available in sizes from 30cm to 200cm. 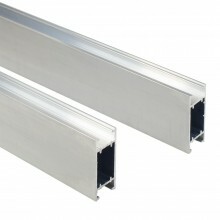 45mm deep, lengths available from 40cm to 200cm. Available from 40cm to 200cm. Available from 120cm to 200cm.